From the Award winning Pedagogs range, this set of 7 laminated A4 essential Question Posters is great for prompting your pupils and brightening up your classroom. 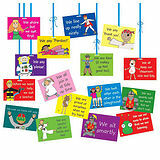 The posters can be used as flash cards or displayed on a wall to make an attractive and educational classroom display. Also included is a photocopiable matrix for practising sentences. Children choose the first and second words to start a sentence and then can work in pairs or use it for a written activity to finish the sentences. 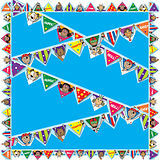 Great for all levels and also beneficial for children speaking english as a second language.